A hauberk is a shirt that is made of chainmail. Hauberk usually refers to a shirt that is mid-thigh in length and features sleeves. 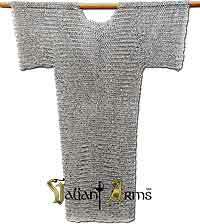 Little hauberk also called haubergeon relates to a shorter version with shorter sleeves. Hauberks that are mid-thigh in length usually have slits to make horseback riding comfortable. The word “hauberk” originated from old German word “halsberge”. The word halsberge referred to small piece of chainmail protecting the neck and the throat. The oldest example of hauberk that dates from the 12th century is kept at the Prague Cathedral in the Czech Republic. The hauberk supposedly belonged to Saint Wenceslaus. The chainmail hauberk was in wide use throughout the entire Europe. It began to disappear when plate armor began to be used instead of hauberk.